Educators are just one click away from accessing information on NASA topics and programs. An alphabetical index is available on all of the For Educators pages on NASA's Web site, http://www.nasa.gov. Visitors can locate specific topics by clicking on the first letter in the word and being taken directly to a page with the desired information. Choose from NASA educational resources, programs and projects, mission information, multimedia, NASA history, aeronautics, space science, Earth science, space operations, the Vision for Space Exploration and much more. 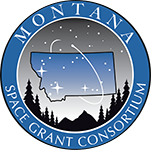 Please contact us, msgc [at] montana [dot] edu, if you apply for one of these programs. We may be able to help with your application.